balance Experts in coverage solutions for single entities, groups and public entities, our integrated approach gives self-insureds greater stability and control over their self-funded plan. Unparalleled underwriting expertise, innovative risk management and in-house claims management, work in sync and in perfect balance for best possible outcomes. elf-insured employers are increasingly using web portals for a dual purpose: streamline internal HR and administrative processes, as well as strengthen benefits communication, education and enrollment â&#x20AC;&#x201C; particularly for employees who travel or work remotely. The end game is to bolster cost-containment strategies with better engagement of health plan participants and much more informed decision making. A residual effect is that it also can raise benefits satisfaction, which helps improve health outcomes and lower costs. Popular applications include claim submission from a mobile device, full mobile compatibility for web portal features and multi-language display. This trend recognizes a growing preference to conduct health care activities from a smartphone or tablet in an increasingly virtual workplace. Health care consumers can receive SMS (short message service) texts for important updates such as a change in their claim status, availability of an explanation-of-benefits (EOB) form, etc. The power of portals also can be harnessed to customize communications that target various audiences with information on what’s most relevant to their needs. User-friendly strategies “Employers are increasingly looking for ways to structure comprehensive strategies that ultimately simplify the navigation process and makes meaningful connections for their employees across all the various programs, and ultimately, to improve the consumer experience,” says Ellen Kelsay, chief strategy officer at the National Business Group on Health (NBGH). What’s critical to this effort is a robust, enterprise-wide portal or platform that creates linkages across all programs with data feeds for both internal and external partners, she explains. The mission applies even to very large employers with lean HR and benefit teams to administer their health benefit plans, she adds. From the employee perspective, Kelsay says the admin element translates into accessing information about their health insurance, pharmacy claims, disability benefits, paid time off, etc. – and taking action. Portals serve as a one-stop shopping experience to enroll in programs that she says help employees manage chronic conditions often via disparate plans and different third-party administrators (TPAs). Backend support is also necessary to navigate aspects of administration pertaining to those plans. Forward-thinking self-funded employers are using portals to educate employees and dependents not only about their coverage, but also “how they can be good stewards of the company’s money when using health care services,” observes Sean Garrett, chief operating officer of Plexis Healthcare Systems, a leading payer technology company that delivers core administration and claims processing solutions to health care payers. YOUR BEST PARTNER EARNS YOUR TRUST EVERY DAY Employers of all sizes experience high-cost medical claims. As an independent stop-loss provider with strong financial ratings, weâ&#x20AC;&#x2122;re here for you. Listening to you. Helping you design a stop-loss plan that meets your needs with specialized options. Delivering hassle-free claims reimbursements. Want a partner that earns your trust every day? Go with Sun Life. Ask your Sun Life Stop-Loss specialist how we can put our expertise to work for you. One area that can have a deep impact is prescription drug benefits, whose costs can be better managed when covered lives are steered toward generics or less expensive brand names. He says portals serve as a handy conduit for communicating cost and quality comparisons, particularly through increasingly popular mobile apps. “Consumers are far more used to self-service these days through their handheld device than they are having to pick up a phone or send an email and wait for a reply,” he says. There has been a noticeable trend toward transactional portals that help employees understand their benefits and health savings account status, particularly if they’re in a high-deductible plan, as well as how to process a claim. They’re also heavily expanding into disease management programs, including a focus on chronic obstructive pulmonary disease, commonly known as COPD, asthma or prescribed care following a heart attack, according to David Rouatt, VP of sales and a founding partner of HealthDay, a division of ScoutNews, LLC that provides daily health news and video for consumers and medical professionals. He says many hospitals have adopted this approach, allowing patients to schedule an appointment, view lab test results, check bills or review prescribed treatments. From an admin standpoint, portals transcend stagnant legacy systems with a vibrant approach that integrates with all vendor apps used in common adjudication work involving EOBs, online enrollment, interactive wellness, telemedicine and electronic medical record storage. “It’s even more important than the primary adjudication software system, which all TPAs or payers certainly rely on because the portal now becomes the central meeting point and face of the organization,” explains James Burkholder, president and CEO of Health Portal Solutions. Approachable · Knowledgeable · Dependable. We are well-versed in customized offerings and rooted in strategic thinking. Our dedicated team provides a consultative approach to achieve the best risk solution for you. Visit starlinegroup.com today to learn more. The primary focus of independent TPAs that represent most of the payer community that supports self-insurance is an enhanced level of service and support for not only employers and employees, but also providers. Hence, the true value of portals, which he says enable self-insured employers to efficiently use critical data elements for tracking, managing and controlling costs. Perhaps nowhere is the use of portals as critical as in the enrollment application. Burkholder recalls that Blue Cross and Blue Shield of Texas recently notified all insurance brokers across the state that they no longer accept paper on their fully insured plans. However, he believes employees are more inclined to log in through an employer’s site than a carrier or TPA, which offers the ability a more “seamless interaction” without having to retain multiple usernames and passwords through simple links. Portals allow members to communicate with health plan administrators who can field their inquiries or address concerns in a direct, secure and private way. “As the claim is adjudicated, I’m able to not only see what went toward my deductible, co-pay or how it was paid, but also what my responsibility is,” Burkholder says. In addition, he notes that most portals now offer some form of instant messaging similar to common commercial websites with a pop-up screen offering assistance from a customer-service rep. The industry isn’t without its growing pains. One unintended consequence involving the proliferation of innovative health technology is the need for a common platform that integrates disparate systems, according to Kelsay. “Portals provide links and access to all of them through a one holistic experience,” she explains, “but behind the scenes, the employee is still going to point-solution A’s site and point-solution B’s site. So there’s a lot of opportunity for somebody who comes to make with a holistic enterprise-wide platform that truly does integrate all of those into one common user experience.” Also, not everyone is completely comfortable with a paperless future. While NBGH members often crow about their portals, Kelsay says it’s still important to incorporate some traditional modes of communication with a multi-faceted approach to educating employees. This can help employees in a manufacturing setting or those in a secure location without access to mobile technologies or desktops during work hours. Break room posters, benefit fairs, kiosks and in-person training can be used to supplement and enhance an employer’s portal. Influencing behavior Just how effective a portal is depends in part on employee awareness. “There has to be a program in place within the self-insured employer company that promotes access to the website where the portal is either on an intranet or extranet,” Rouatt explains. “In many cases, the only reason someone’s going to go to that portal is from a transactional point of view, whereas the employer wants to do more than that.” For example, he says portals pack tremendous power to influence behavior, particularly in areas like depression, weight loss and smoking cessation. Financial incentives may be tied to filling out a health risk assessment, and with the right messaging, employees can sustain success. “There are about eight or nine different key medical issues that drive probably 85% or 90% of the costs that managed care companies end up facing,” Rouatt notes. “There are a huge number of companies providing very vertical programs targeted to employees and subscribers, and the only way they can really register or know about these programs is to do it on the portal.” With the growing use of incentives for wellness-related activities for which portals play a major role, Burkholder sees the potential for a significant return on investment, especially if telemedicine services are included in the mix. Another increasingly popular connection to portals involves wearable devices that he says allow people to monitor their blood pressure or download results that can be shared with a primary care physician. “There has to be a higher degree of support and interaction in order to keep somebody focused on their goal of losing the weight, watching their A1C levels, or whatever it might be,” he says, noting a steady leveling off or reduction of medical expenditures when portals steer members to the most cost-efficient provider, service or procedure. ome medical-claims reduction companies wait until the last minute to resolve your claims – sometimes waiting too long and leaving you and your clients with a bigger bill than necessary. Not us. We apply our never-give-up tenacity to achieve maximum savings on your medical claims, and we promise to turn around claims in 5 business days – and usually faster – so you never lose your ability to dispute provider charges. Some health plans allow their members to access data from a Chatbox platform using artificial intelligence that serves as another channel for people to get the information they need, observes Dan Jimmerson, VP of marketing of Plexis Healthcare Systems. In search of trustworthy content Despite their potential for educating the populace, portals could unwittingly house harmful messages. In an era punctuated by so-called fake news, health care consumers are highly susceptible to “an enormous amount of misleading information” on a range of topics, Rouatt cautions. Examples include autism, measles, mumps and rubella vaccines, as well as controversial treatments for breast cancer or diabetes. He says it’s critically important for health care websites or portals to feature trusted and credible information that’s been constantly vetted. At HealthDay, which Rouatt describes as the Associated Press or Reuters of health care content, all material is evidence-based and sources include leading peer-reviewed medical journals, conferences and government reports. A chief medical officer is even included in the mix to review all articles prior to publication for both consumer and physician audiences. He says that in about 15 years of being in business, HealthDay has never had a significant retraction. More than 100 writers contribute to HealthDay on a monthly basis and about 40 on a weekly basis, while another 60 scribes produce custom content for major health care companies. The company produces about 20 news stories and a handful of videos each day that are syndicated to clients, including WebMD, MedlinePlus, the National Institutes of Health, Merck, Pfizer, etc. The information also is heavily used in patient portals, particularly with self-insured employers that promote healthy living. In many cases, the content reaches employees through some type of social media application. Bruce Shutan is a Los Angeles freelance writer who has closely covered the employee benefits industry for nearly 30 years. Healthy employees build strong businesses. What are you doing to strengthen yours? As featured in the September 2016 issue of Self-Insurer Strengthen your business with In-Sight, the first truly integrated Employee Benefits, Workersâ&#x20AC;&#x2122; Compensation and Health Management program. In-Sight puts the administrative and cost control efforts of these programs into the hands of a single, integrated team. Why? Integration allows us to eliminate administrative oversight, prevent duplicate claims and address potential health issues before they become costly problems. The result? Reduced claims spending and a healthier, more productive workforce. Call IPMG at (888) 470-9569 to learn how In-Sight can strengthen your business. SIIA Members Request Rescission of IRS Captive Reporting Rule in Letter to Treasury, Meetings with Congress hardship and regulatory burdens on American businesses. These regulatory burdens, expected to be included in a report by the Treasury Department later this summer, were requested by President Trump in an April executive order. Members of SIIA’s ERC Working Group provided briefings to Congress on unfair elements of the IRS Notice affecting captive insurance companies that are organized under Revenue Code Section 831(b). •	The average cost for a captive to complete its Notice reporting was $9, 257, compared to a typical range of $1,000 to $4,000 to file a federal tax return. •	The actual time incurred by SIIA members to file the forms required by the Notice averaged 50.97 hours per captive, compared to the IRS estimate of 10 to 16 hours for record-keeping and 6.25 hours for preparation. SIIA members engaged in the captive industry contend that the onerous reporting required by the IRS Notice arose from the agency’s stated contention that some captives are operated primarily for purposes of tax management, estate planning or executive succession rather than pure risk management. “By this Notice, the IRS is handicapping the vast majority of properly operated captives,” said Doug MacGinnitie, CEO of River Oak Risk of Atlanta, who was among the ERC Working Group members participating in the visits to House and Senate offices last month. MacGinnitie said he has noticed a somewhat chilling effect on captive formation following implementation of the IRS Notice. •	The overall cost of Notice compliance by SIIA members alone totaled nearly $23 million. “SIIA adds a lot of value as it brings members of our industry together to advocate for a very great number of captive companies, managers and business owners,” he said. directly to Congress in events such as last month’s. Rick Eldridge, CEO of Intuitive Companies of Denver, also participated in the meetings with Congress. His view is that the majority of the information required by the IRS Notice already is available to the agency if it were managed more efficiently. “We are happy to comply with reasonable requests by the IRS in its effort to regulate our industry but its method to accomplish that is overly burdensome,” Eldridge said. “Most of the information the IRS is asking for already exists in captive companies’ tax returns, but isn’t available for quick correlation. For example, the Notice required paper forms (as opposed to electronic) to be sent to the IRS in Ogden, Utah, in an operating methodology apparently from the 1980’s. “Rather than reviewing data the IRS has on hand within the annual tax returns and their required exhibits, the IRS has asked us, in effect, to repeat the information in new forms that are required from captive insurers, each insured entities’ owners, accountants, actuaries, managers and any other material advsiors,” Eldridge noted. Advocacy by the captive industry initially resulted in an extension by the IRS for filing new forms under the Notice from January to May this year. Underscoring the onerous burden of the Notice, a number of state captive associations are also following SIIA’s lead in reaching out to both Treasury and their own congressional delegations. Now SIIA hopes that the burdensome effects of the Notice can be ameliorated or repealed through regulatory or executive action. SIIA members with inquiries about federal government relations issues are welcome to contact Ryan Work at rwork@siia.org or (202) 595-0642. There is good news for self-insured small group employee health plans in New York: the state legislature passed a bill that extended the grandfather status of existing stop-loss insurance policies for groups of 51100 for an additional year to January 1, 2019. The bill had been passed by both houses of the Assembly but had not yet been signed by Governor Andrew M. Cuomo as this issue was published. An earlier SIIA-backed bill to permanently allow stop-loss coverage for such groups rather than a minimum of 100 members was deferred as the Department of Financial Services (DFS) launched a study of the use of stop-loss insurance for completion by March 1, 2018. Madden believes that even the grandfathering extension – hopefully in advance of the legislated small group minimum of 51 members – can help New York maintain employment. “Several of our clients are located near the Pennsylvania border and could go either way,” he said. “The important thing to them is to be able to retain the flexibility and control of self-funding.” Madden believes that defining small groups for this purpose will benefit the market for self-insured groups of all sizes. Upon receipt of information from the payer. “Even companies above the 100-member level would be hurt if inventories of insurance opportunities would be restricted. Maintaining a robust small group market would bring advantages of more insurers, more competition and a stronger self-insurance market for employers of all sizes,” he said. Madden looks forward to his company participating Ellie Nieves in the DFS study, if that is possible, and is making sure that Lawley clients are kept informed as the issue continues. “We reach out continually to extend grassroots advocacy into the retail level,” he said. “Who else would contact employers with the information they need to participate in the legislative process?” Advocacy to re-establish New York’s small group definition at the 51-member level for purposes of obtaining stop-loss insurance has become a multi-year effort according to Ellie Nieves, Vice President and Counsel for Government Affairs of Guardian Life Insurance, which is active in the New York stop-loss market. Nieves says that lobbying by the self-insurance industry in Albany has been extremely important to raise legislators’ understanding of self-insurance for employee benefits. “It’s vitally important for legislators to understand their constituents’ needs in a fairly complicated area. The industry is fortunate to have good partners in the employer community to help us educate legislators. “Organizations like SIIA play an important role in bringing together a broad-based coalition of employers, carriers and third party administrators to help legislators be better informed so that these specialized issues become ‘real’ to them,” she said. As the New York DFS study takes shape, SIIA is actively engaged in helping to identify employers and members of the self-insurance industry who can be instrumental in its success. SIIA members who wish to join the state government relations advocacy team are invited to contact Adam Brackemyre at the Washington, DC, office, (202) 463-8161 or abrackemyre@siia.org. SO, WHY ARE YOU PAYING FOR PHARMACIES THAT YOUR MEMBERS ARE NEVER GOING TO USE? Script Care’s Select Networks cut costs, not access. WE ARE your pharmacy network expert. Medical stop loss insurance from Berkshire Hathaway Specialty Insurance comes with a most trusted name and the stability of an exceptionally strong balance sheet. Our executive team has 30 years of experience and a commitment to tailoring solutions and paying claims quickly. All of which is key to ensuring your programâ&#x20AC;&#x2122;s success for years to come. With so many choices, you can make this one with certainty. he Sharing Economy is poised to grow at exponential rates over the next eight years. Traditional insurance companies have been slow moving when it comes to meeting the insurance needs of these types companies. Captives, with their flexibility and entrepreneurial mind-set, are crossing the bridge, offering insurance for companies in the Sharing Economy. The Sharing Economy and Traditional Insurance Just as the Sharing Economy is disruptive to established markets, it is disrupting to how insurers have long-operated. When it comes to insurance coverage, they are disrupting decades (or even centuries) of actuarial data making it difficult to define and forecast the risks they may face. While the types of risk are not unique—auto liability, workers’ compensation, homeowners, Directors & Officers—the situations that could lead to claims are. According to Tina Summers, senior vice president, Marsh Captive Solutions, the challenge to insurance underwriters, “Is the relationship between the company and the exposure. For example, auto liability coverage for a company that owns the fleet of cars is pretty straight-forward. It gets complicated when the company is providing a technology platform to connect a buyer to a service that is delivered via a car owned by an independent contractor.” Especially if the owner of that car uses it for both personal use and as a service provider for companies like Uber or Lyft. Similar challenges arise for homeowners renting a room or a whole property through Airbnb or Homeaway. With the rise of these new types of markets, consumers can rent surfboards or parking spaces from individuals, consumers can be matched with services providers—such as movers or a handyman—get low-interest peer-to-peer loans, or have food delivered. Companies in the Sharing Economy have one thing in common—they are reimaging how goods and services are provided to consumers. And these break-out companies are just getting started. The Sharing Economy was estimated to be worth approximately $28 billion in 2015 and is estimated to grow to more than $300 billion by 2025. On top of this, these business models and companies are so new that there is not enough loss experience for underwriters to make accurate estimates. “Regulation is a key challenge as it varies by state, municipality, county, airport jurisdiction, etc.,” Summers added. When every locality has different laws regarding home rental, livery, or other peer-to-peer transaction, that effects insurance policies. Since most of the companies in the Sharing Economy operate nationwide, or even internationally, it adds complications to the cut-and-paste policy language that most insurers rely on. The potential for risk for Sharing Economy companies may be much higher than anticipated as well, which could leave companies open for huge risk. There is a genuine lack of knowledge regarding the exposures these disruptive companies could face which makes it difficult to find an insurer that can offer adequate coverage. With all of the insurance challenges companies in the Sharing Economy face, captives can play an advantageous role. The flexibility that captives are known for translates especially well to start-up companies in the Sharing Economy. The customized policies, underwriting and claims efficiencies, and detailed risk management that distinguishes captives means they will be as agile as the start-ups they work with in the Sharing Economy. Captives give these companies the ability to better protect themselves as they continue to grow and evolve. D E DIC A T E D T O R E S UL T S .
Lockton Dunning Benefits www.lockton.com © 2017 Lockton Companies. All rights reserved. As Summers described it, “Since captives are essentially a formalized vehicle for self-insurance they are able to offer a number of benefits to companies in the Sharing Economy space— funding of retained risk in captive structure [that] can provide leverage when negotiating with commercial markets; improved unit economics due to flexibility that captives allow; ability to manuscript wording; [and the] ability to offer insurance to connected but unrelated parties (i.e., delivery drivers).” Another important way a captive can help these companies is by giving them access to the reinsurance market. “These markets provide insurance-to-insurance companies and cannot be accessed by companies directly,” said Summers. “In some cases, reinsurance markets have an appetite for risk that retail markets are not interested in. They may also offer broader coverage and more competitive pricing.” This is an ideal fit as start-up companies in the Sharing Economy tend to be more willing to accept risk. Being able to obtain insurance in innovative ways makes more sense for companies in this space. To start a captive, it can generally take several years, giving companies time to build up actuarial data in the traditional market, but captive managers are finding that in the Sharing Economy businesses are seeking out captives earlier than is usually expected. Many times start-ups often have an excess of investment capital that can be funneled into a captive, allowing them to access captive insurance much sooner than most conventional companies would be able too. Insurance is complicated. But it doesn’t have to be difficult to understand. Insurance isn’t a particularly intuitive concept, whether you’re figuring out how to price risk, design a risk classification plan or set aside the right amount to pay future claims. We get that. That’s why at Pinnacle, we’ll walk through our actuarial findings with you, explain those findings in plain English and ensure you know exactly what’s driving the results. You’ll come away not only understanding how the numbers impact your organization’s long-term viability, but equipped to make better business decisions. Yet, like being insured through the traditional market, companies in the Sharing Economy seeking to access insurance through a captive still lack the actuarial data that makes underwriting a challenge. This presents a problem to captive managers and to regulators. Because companies in the Sharing Economy are so disruptive to standard business models, their potential for risk exposure may be much higher than businesses in more traditional industries. This creates a gap between what can be expected and what potentially may happen. While captives make sense for many companies in the Sharing Economy to get appropriate insurance coverage, they can also be used to cultivate relationships with service providers and customers. The juggernauts of the Sharing Economy, Uber and Airbnb, have both developed insurance programs for their customers and service providers. However, most start-ups won’t have the means to develop a program on their own. Through their captive they can offer their providers and clients access to low-cost insurance. It’s just another a way for these companies to grow with and maintain high-quality providers while giving their customers a great experience. As the Sharing Economy continues to grow exponentially, captives will be able to offer evolutionary insurance coverage for companies that are expanding the way that we think of business, keeping up with and covering their risks. Karrie Hyatt is a freelance writer who has been involved in the captive industry for more than ten years. More information about her work can be found at: www.karriehyatt. com. When it comes to reducing healthcare cost and plan management, you may need some help. Is what you are doing effective? What are you doing that’s different? Are your employees engaged and willing to help? Are your employees “educated consumers” Are your employees and management satisfied? Call us today to begin a conversation about your goals and our solutions. Potential Impact of Health Care Reform on ACA Reporting With the start and stop of “repeal and replace” efforts, it is unclear when changes may be coming to reporting required under the Affordable Care Act (“ACA”). However, even if proposals such as the House’s American Health Care Act (“AHCA”) and the Senate’s Better Care Reconciliation Act (“BCRA”) make reporting easier, they would not immediately eliminate employer reporting responsibility. In fact, the IRS has been sending letters to employers who it believes should have filed Form 1094-C and Forms 1095-C, but did not file. These IRS efforts should serve as a reminder that employers are not off the hook, and should remain focused on complying with the ACA reporting requirements. The ACA requires applicable large employers (“ALEs”) to furnish and file Form 1095-C annually. Generally, an employer is an ALE if it had 50 or more full-time and/or full-time equivalent employees in the prior calendar year. The Form 1095-C provides information on when and if the employer offered a full-time employee health coverage and information about that coverage. ALEs must also file Form 1094-C, which summarizes their Form 1095Cs submissions. The IRS considers whether reasonable efforts were made to prepare for reporting to the IRS and furnishing to employees. However, in the case of intentional disregard, the potential penalty increases to $1,060 per 1095-C ($530 for not furnishing to the employee and another $530 for not filing with the IRS) without any limit. The IRS provided “good faith” penalty relief for incorrect or incomplete Form 1094-C and Forms 1095-Cs, and will continue to provide this good faith relief for 2017.4 As a result, the IRS will not assess penalties that report incorrect or incomplete information if they can show good faith efforts to comply with the reporting requirements. However, this penalty relief is not available to employers that fail to furnish or file the forms, miss applicable deadlines, and/or do not make good faith efforts to comply. Most well-advised large employers made good faith efforts to file timely, even if those filings might not have been perfect (more on that below), so that they could obtain the IRS good faith penalty relief. It is very common for an employer’s 1095 file to be accepted by the IRS with errors related to mismatches in the name and taxpayer identification number provided on the form—typically for covered dependents identified in Part III of the 1095-C. How are employers supposed to respond? There is much confusion around this issue and the confusion arises from the seemingly conflicting guidance we are receiving from the IRS. very difficult to distinguish the difference between the good faith standard and the reasonable cause standard as applied to TIN errors because there are special rules in the reasonable cause requirements related to incorrect TINs. IRS Publication 1586 indicates that no penalties will be assessed with respect to TIN errors if the employer satisfies the solicitation requirements in Internal Revenue Code (“Code”) Section 6724 and the final regulations issued thereunder. Generally speaking, the final regulations under Code Section 6724 indicate that the employer must solicit a TIN within 75 days after receiving notice of the error from Treasury OR receiving a penalty assessment. If we stop right there, then it would seem clear that employers must solicit the correct TIN if a 1095 was accepted with TIN in order to satisfy the reasonable cause standard and avoid penalties because the employer has presumably received notice of the error from the IRS. However, according to Publication 1586, if the employer solicits and the taxpayer provides the correct information, the employer need only hold on to the correct information and use it for subsequent filings (in other words, there is no need to actually file a corrected 1095). But we can’t stop there. In an effort to better align the Code Section 6724 rules with the 1095 requirements, the IRS issued proposed regulations last year under Code Section 6055 that attempt to clarify the manner in which the Code Section 6724 solicitation rules would apply in the 1095 context (e.g. with respect to TINs for covered individuals identified IN Part III of 1095-C or on the 1095-B). The proposed rules focused mostly on the dates that employers are considered to have made a solicitation. There is, however, an interesting footnote in the proposed rules that indicates that the error notice from the IRS indicating that the name/ TIN do not match is neither a penalty assessment nor a requirement to solicit. This means employers do not have to do anything, right? It does seem to suggest that “do nothing” is an appropriate response for employers; however, this footnote in a proposed regulation contradicts the final solicitation regulations and the reasonable cause guidance in Publication 1586. It also contradicts the instructions to the Form 1095-B and C, which identify TIN errors as one of the errors that require correction. What about the good faith standard? Does it provide clarity? As noted above, employers are subject to the good faith standard, which is something less than reasonable cause. So what is “good faith”? The IRS has not provided a hard and fast rule but the IRS has made it clear that it will take into account generally (for all errors—not just TIN errors) the steps the employer takes to correct the information once the employer knows it was wrong. That standard, along with the instructions, seem to suggest that employers who receive the error notice from the IRS must not only solicit but also correct if they receive corrections from the individual. So with all of the confusion and contradictions, what is the path that employers should take. Can employers avoid penalties if they do absolutely nothing? Perhaps—in reliance on the footnote in proposed regulations-- but we question whether employers wish to be in a position of having to rely on a footnote in proposed regulations when responding to a penalty assessment. Should employers solicit and then correct if the correct TIN is provided? That is a fail proof path but may be administratively burdensome for many—and may be unnecessary. Perhaps the compromise suggested by the guidance mentioned above is to solicit following notice of the errors but only use the corrected information on subsequent 1095s. Additional clarifying guidance from the IRS on this issue would be helpful. •	The employer was an ALE and already filed Form 1094-C and Forms 1095-C with the IRS. In this case, the IRS requests the company name used for filing, the employer identification number (EIN), and filing date. •	The employer did not comply previously, but is now enclosing its Form 1094-C and Forms 1095-C. This option is not available for employers that were required to file electronically (generally employers filing 250 or more 1095-Cs). •	Employer was an ALE and will file for the year in question. In this case, the IRS requests the company name used for filing, the employer identification number (EIN), and the anticipated filing date. If the anticipated filing date is more than 90 days after the letter day, then the IRS requests an explanation. •	Employer was not an ALE for the calendar year. •	Other, which requires a statement about why the forms were not filed and any NOTE: the footnote in the proposed regulations only applies to the Code Section 6055 reporting requirements. actions the employer plans to take. Most large employers made good faith efforts to furnish and file Forms 1095-C and file Form 1094-C, so they are unlikely to receive this letter from the IRS. As noted, the House’s AHCA and Senate’s BCRA do not repeal the ACA’s reporting requirements for large employers, although they might be simplified in future years. Procedural rules limit reconciliation efforts to provisions that affect tax and revenue, which does not include the reporting rules. Thus, employers should not expect relief from the reporting requirements soon. Accordingly, employers might want to correct any inaccuracies in their Forms 1094-C and 1095-C filings to ensure they fall on the right side of the IRS’s “good faith” relief. References 1- See IRS Notice 2013-45; IRS Notice 2016-4 (further extending the filing deadline for the 2015 calendar year). 2- Code §§ 6721 and 6722; Rev. Proc. 2015-53. 3- Code § 6724; Treas. Reg. § 301.6056-1(i)(1). 4- IRS Notice 2016-70. State-mandated Continuation of Coverage and ERISA Preemption: What Self-funded Employers Need to Know By Brady Bizarro, Esq. ccording to one prominent health law attorney, “Although in its text ‘hospital’ appears only once and ‘physician’ not all, ERISA may be the most important law [prior to the Affordable Care Act] affecting health care in the United States.” William Sage, “Health Law 2000”: The Legal System and the Changing Health Care Market, 15(3) Health Aff. 9 (Aug. 1996). Understanding the intricacies of the Employee Retirement Income Security Act of 1973 (“ERISA”) and its preemption clause can be a challenge for even the most assiduous attorney. The statute supersedes any and all state laws insofar as they “relate to” any employee benefit plan. It also contains a “savings clause” which preserves the state’s traditional role of regulating insurance. That clause is then qualified by the “deemer clause,” which acts as a kind of escape hatch through the savings clause. For employers, that escape hatch is key because it allows them to avoid state insurance regulations by self-funding their health plans rather than by purchasing health insurance. Increasingly, however, states are testing the limits of preemption by passing leave laws which mandate that employers continue health insurance coverage for eligible employees out on leave. Perhaps the best known leave law is the federal Family and Medical Leave Act of 1993 (“FMLA”). The statute, like most other federal laws, applies regardless of the source of insurance. It requires employers to provide twelve weeks of unpaid, job-protected leave for an employee’s own serious health condition, for the birth or adoption of a child, or to care for a spouse, parent, or child with an illness. Significantly, the law also requires employers to maintain group health benefits for employees who take FMLA leave. Even though this continuation of coverage requirement clearly impacts self-funded ERISA plans, federal laws such as the FMLA are outside the scope of ERISA preemption. At the state level, five states have now passed laws to address a perceived gap in the FMLA, granting eligible employees paid family leave: California, New Jersey, Rhode Island, Washington, and New York. Rhode Island law requires four weeks of paid leave, California and New Jersey each offer six weeks of paid leave, and Washington offers up to twelve weeks per year. New York’s Paid Family Leave Act (“PFL”), scheduled to take effect on January 1, 2018, offers one of the longest and most comprehensive paid family leave laws in the country. What makes the PFL unique is not just that it requires employers to provide twelve weeks of paid family leave; it also requires employers to continue health insurance coverage to employees out on leave. While this state-mandated employer obligation would seem to fall squarely under the purview of ERISA preemption, it turns out that determining the scope of ERISA preemption is an arduous task. This implies that there is no relevant distinction between obligations imposed on the employer versus on the employee benefit plan for purposes of determining whether ERISA preemption applies. Simply put, state laws which impose obligations on employers, and not specifically plans, may still be preempted. In addition, the Court has held that ERISA does not preempt state laws which have only a tenuous, remote, or peripheral connection with an ERISA plan, as is typically the case with laws of general applicability. insurance for their employees to provide equivalent health insurance coverage for employees eligible for workersâ&#x20AC;&#x2122; compensation benefits. In earlier cases, petitioners argued that ERISA preemption should be construed to require a two-step analysis: if the state law “related to” an ERISA-covered plan, they argued, it may still survive preemption if employers could comply with the law through separately administered plans exempt from ERISA (making the distinction between a plan requirement and an employer requirement). See generally Metropolitan Life Ins. Co. v. Massachusetts, 471 U.S. 724 (1985). In Greater Washington, the U.S. Supreme Court dismissed that analysis, stating, “We cannot engraft a two-step analysis onto a one-step statute.” See Greater Washington, at 133. Despite the Court’s rulings, the breadth of the “relate to” clause remained unclear and the question of state-mandated continuation of coverage was not directly addressed. In 2005, the Department of Labor (“DOL”) seemed to put this issue to rest in an advisory opinion on the applicability of leave substitution provisions of the Washington State Family Care Act (“FCA”) to employee benefit plans. The FCA permits employees entitled to sick leave or other paid time off to use that paid time off to care for certain relatives of the employee who had health conditions or medical emergencies. As part of its analysis, the DOL analyzed section 401(b) of the FMLA, which provides that state family leave laws at least as generous as the FMLA are not preempted by “this Act or any amendment made by this Act.” 29 U.S.C. § 2651(b). Further, the DOL cited to a 1993 Senate report which recounts a colloquy between Senators Chris Dodd (D-CT) and Russ Feingold (D-WI). The discussion involved the leave substitution provisions of the Wisconsin FMLA and ERISA preemption. The DOL relied on this exchange as additional support for the notion that state family leave laws at least as generous as the FMLA (including leave laws that provide continuation of health insurance or other benefits) are not preempted by ERISA or any other federal law. As a result of the department’s guidance, it appeared as if state family leave laws enjoyed special protections from ERISA preemption. In 2014, the Sixth Circuit Court of Appeals considered the same issue and reached the opposite conclusion. In Sherfel v. Newson, 768 F.3d 561 (2014), the Court found that the leave substitution provisions of Wisconsin’s FMLA sufficiently “related to” an ERISA plan such that they were preempted by ERISA. Specifically, the Court held that the state law would “mandate the payment of benefits contrary to the [written] terms of an ERISA plan,” thus undermining one of ERISA’s chief purposes; achieving a uniform administrative scheme for employers. Newson, at 564. As part of its analysis of the preemption issue, the Court also dismissed the legislative history relied upon by the DOL in an uncommonly blunt (and borderline satirical) manner. Considering whether legislators intended to preclude the preemption of state family leave laws by ERISA, the Court observed, “[T]he idea that this colloquy ever passed the lips of any Senator is an obvious fiction. Colloquies of this sort get inserted into the Congressional Record all the time, usually at the request of a lobbyist…” Newson, at 570. By ruling that a state family leave law was preempted by ERISA, the Sixth Circuit Court of Appeals aligned itself with the U.S. Supreme Court’s earlier jurisprudence on preemption. It remains to be seen how other Circuit Courts will address similar challenges to state leave laws; especially those that mandate continuation of coverage. At AmWINS Group Benefits our team of specialists wakes up every morning committed to bringing your team innovative solutions to the opportunities and challenges you and your self-funded clients face. That’s the competitive advantage you get with AmWINS Group Benefits. The conservative approach for employers would be to continue health coverage when required by state law; however, the Sixth Circuit is the highest court to address this issue to date, and self-funded employers would be on solid footing to use ERISA preemption as a shield against state-mandated continuation of coverage. Paid family leave is one of the few policies in Washington, D.C. that has bipartisan support, and employers should expect to see more states pass laws akin to New York’s Paid Family Leave Act. The President explicitly referred to paid family leave in a speech to a joint session of Congress on February 28, and his 2018 budget proposes six weeks of federal paid parental leave. While it remains unclear if that policy will become law, the trend is likely to continue at the state level, and as those laws impact self-funded health plans, the issue of continuation of coverage and ERISA preemption will increasingly attract the scrutiny of the courts. Brady Bizarro, Esq. is an attorney with The Phia Group, LLC. Artex provides a full range of alternative risk management solutions, customized for our clients’ individual challenges and opportunities. Powered by independent thought and an innovative approach, we empower our clients and partners to make educated risk management decisions with confidence. Would you navigate uncharted waters without a compass? As a leader in Group Captives, Berkley Accident and Health can steer you in the right direction. With EmCapÂŽ, our innovative Group Captive solution, we can help guide midsize employers to greater stability, transparency, and control with their employee benefits. With Berkley Accident and Health, protecting your self-funded plan can be smooth sailing. This example is illustrative only and not indicative of actual past or future results. Stop Loss is underwritten by Berkley Life and Health Insurance Company, a member company of W. R. Berkley Corporation and rated A+ (Superior) by A.M. Best, and involves the formation of a group captive insurance program that involves other employers and requires other legal entities. Berkley and its affiliates do not provide tax, legal, or regulatory advice concerning EmCap. You should seek appropriate tax, legal, regulatory, or other counsel regarding the EmCap program, including, but not limited to, counsel in the areas of ERISA, multiple employer welfare arrangements (MEWAs), taxation, and captives. EmCap is not available to all employers or in all states. elf-Insurance Institute of America’s (SIIA) upcoming National Conference & Expo is scheduled for October 8th-10th at the JW Marriott Desert Ridge Resort in Phoenix, AZ. This is the world’s largest event focused exclusively on the self-insurance/alternative risk transfer marketplace and typically attracts more than 1,700 attendees from around the United States, and from a growing number of countries around the world. The National Conference & Expo will feature more than 40 educational sessions focusing on self-insured group health plans, captive insurance, self-insured workers’ compensation programs and international self-insurance/ART trends. If you arrive early, on Saturday evening, October 7th, there will be an invitation only event for the Self-Insurance Political Action Committee (SIPAC) contributors. Please contact Wrenne Bartlett at wbartlett@siia.org for details. The Self-Insurance Educational Foundation (SIEF) will be hosting one of their popular golf tournaments on October 8, 2017 at the Wildfire Golf Club at the JW Marriott Desert Ridge Resort. The golf tournament is open to all conference registrants, and promise to be an excellent opportunity to network with executive-level industry colleagues and peers. The tournament will be a scramble format and you can either sign up as an individual or reserve a foursome. Correspondent and Host of “The Foxhole” on Fox News, takes you down the “Foxhole” for a closer look at the hottest stories coming out of the White House, Congress and the media itself on Monday, October 9th at 8:30 am. Other general sessions include The Ripple Effect Principle, with Robert Stevenson, Author & Nationally Recognized Speaker, and Going Beyond the 3Ls and 3Gs (Lunch, Lunch, Lunch, Golf, Golf, Golf) with Meghan Jones, Vice President, Client Accounts of Ocozzio and Annie Smith, Vice President, Marketing Strategy of Ocozzio. The always popular end of conference party will be held on the evening of October 10th, and will be a great way to cap off your conference experience and fit in one last round of networking, so you are encouraged to make your travel plans accordingly! Many senior industry executives representing TPAs, employers, stop-loss carriers, captive managers, brokers and other key players in the self-insurance marketplace have already registered, making this a truly must-attend event. Detailed conference information, including registration and sponsorship opportunity forms, can be accessed on-line at www.siia.org/national, or by calling 800/851-7789. We look forward to seeing you in Phoenix in October! 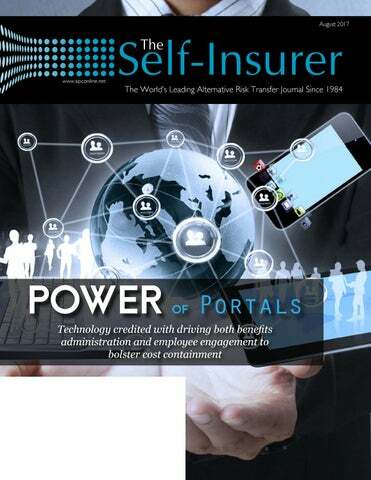 SIIA Diamond, Gold, and Silver member companies are leaders in the self-insurance/captive insurance marketplace. Provided below are news highlights from these upgraded members. News items should be submitted to Wrenne Bartlett at wbartlett@siia.org. All submissions are subject to editing for brevity. Information about upgraded memberships can be accessed online at www.siia.org. For immediate assistance, please contact Jennifer Ivy at jivy@siia.org. If you would like to learn more about the benefits of SIIAâ&#x20AC;&#x2122;s premium memberships, please contact Jennifer Ivy and jivy@siia.org. Crafted to guard financial health. •	Must have experience in healthcare, experience in self-funded industry preferred. Lucent Health products deliver up to 80% in annual plan savings. Send resume to Karen Engel, Finance and Administrative Coordinator, at KEngel@ renalogic.com. Renalogic (formerly DCC, Inc.), headquartered in Phoenix, AZ, was founded in 2002 as a specialty dialysis cost-containment company. DCC, Inc., as it was known then, was established to help clients who were struggling to find a solution to address the unique and costly market dynamics in the dialysis provider community. Visit www.renalogic.com. As the Medical Underwriting Nurse for the Northeast Region, you will utilize professional and clinical knowledge to assess risk and review large medical claims, perform risk assessment and cost analysis/cost projection for the regional underwriting staff. Acts as support for renewal and new business underwriting. This includes, but is not limited to, assessing the severity of on-going claims, adjusting reserved for accuracy, evaluating medical risks and assigning cost projections. Qualified candidates will be a Registered Nurse with ADN, Diploma, or BSN, and or 5-7 years of equivalent combination of education and or experience. About Tokio Marine HCC – Stop Loss Group For more than 35 years, HCC Life Insurance Company, operating as Tokio Marine HCC – Stop Loss Group, has been leading the way in medical stop loss insurance for employers and plans who self-fund their benefit plans. Rated A++ (Superior) by A.M. Best Company, Tokio Marine HCC – Stop Loss Group is backed by the financial stability of its parent company, Tokio Marine HCC. Tokio Marine HCC – Stop Loss Group delivers competitive coverage through exceptional customer service. Our team of underwriters, claim specialists, actuaries and medical professionals provides personal service and professional expertise to a network of producers and third party administrators (TPAs) across the United States. Visit www.tmhcc.com/life. Underwriter – Northeast Regional Office – Wakefield, Massachusetts As an Underwriter for the Northeast Region, you’ll establish and maintain producer relationships while making underwriting recommendations and decisions to protect the financial assets of the company. The geographic territory of the region includes Connecticut, Delaware, Maine, Maryland, Massachusetts, New Hampshire, New Jersey, New York, Ohio, Pennsylvania, Rhode Island, Vermont, and Washington D.C. Qualified candidates will possess a four-year degree, and 3-5 years previous experience and success in health insurance underwriting, and excellent analytical, organizational, and communication skills. Interested individuals should email a current resume to stoplosshr@ tmhcc.com. Silver Members The Pennsylvania Department of Health has certified HHC Group as a Utilization Review Entity for Pennsylvania Managed Care Plans The Pennsylvania Department of Health has certified H.H.C. Group as a Utilization Review Entity for Pennsylvania Managed Care Plans. The State has also certified HHC Group to conduct External Grievance Appeal Reviews received from consumers and providers of health service decisions by Managed Care Plans. The State has begun assigning HHC Group cases for review. Utilization Review Entities or Independent Review Organizations (IRO) provide peer review services when insurers deny health insurance claims. The purpose of these reviews is to determine if a service is medically necessary, medically appropriate, experimental or investigational. The Affordable Care Act requires insurance companies to contract with at least three IROs that are nationally accredited. My experience was exceptional. I am in health care and very skeptical. This experience proved me wrong. Saved me literally thousands of dollars. BridgeHealth helped me focus more on recovering than on medical billing stress, which I am eternally grateful for. * Actual member comments about their surgery through the BridgeHealth program. HHC Group provides Internal and External Independent Peer Reviews for insurance companies, health maintenance organizations, self-insured companies and ERISA plans. The team overseeing the review process utilizes its combined 125 years of healthcare experience to ensure that every review fully answers all questions being asked, cites the appropriate medical guidelines, and is clearly written and grammatically correct. HHC Group serves a Utilization Review Agency, Licensed\Certified\External IRO, Private Review Agent or Licensed Medical Claims Review Agency in 25 states. About HHC Group HHC Group is a leading national health insurance consulting company providing a wide range of cost containment solutions for Insurers, Third Party Administrators, Self-Insured Employee Health Plans, Health Maintenance Organizations (HMOs), ERISA and Government Health Plans. HHC Group utilizes a combination of highly skilled professionals and advanced information technology tools to consistently deliver targeted solutions, significant savings and exceptional client service. Pareto Captive Has Opportunities for Sales Professionals Pareto Captive Services, LLC (“Pareto Captive”) continues to grow and is seeking to add to its team of sales professionals. If you’re a competitive self-starter that is looking for a “no-cap” compensation plan, you excel at developing strategic relationships, thrive in a fast paced, results oriented work environment with minimal administrative responsibilities, please keep reading. Job Title Regional Vice President of Sales Summary Pareto Captive’s sales team is responsible for calling on consultants, explaining our product and its value proposition, analyzing submissions, and presenting quotes to consultants and employers. The position requires extensive out of town travel, including proposal presentations, seminars, and board meetings. Location Pareto Captive is located in Philadelphia and has business spread throughout the country. While we have a slight preference to locate new team members in Philadelphia, we are open to other locations too, as the individual may be able to work out of his/her house. Outside of Philadelphia, areas of particular interest to us include (but are not limited to) Seattle, Denver, Phoenix, Chicago, Texas, California, Florida and the Carolinas. Mind over risk. The Stop Loss Group, a member of Tokio Marine HCC, provides the self-insured industry with innovative solutions to protect self-funded employers from potentially catastrophic losses. We offer flexible captive solutions that range from fronting and reinsurance arrangements to our turnkey stop loss program. We also offer specialized solutions for specialty markets, including Taft Hartley and multiemployer organizations. Interested individuals should submit a cover letter and resume (or a cover letter and a link to a LinkedIn page) to careers@ paretocaptive.com. All communication will be confidential. About Pareto Captive Pareto Captive is the nationâ&#x20AC;&#x2122;s largest manager of member-owned benefit captives. Nearly 400 employers with approximately 45,000 enrolled employees use five different Pareto captive programs to reduce both the cost and volatility of employee benefits. Visit www.paretocaptive. com. Gold Member The Self-Insurance Institute of America, Inc. (SIIA) announced that Rx-Precision has joined SIIA as a Gold member, confirming the companyâ&#x20AC;&#x2122;s intent of establishing a leadership position within the self-insurance marketplace. This latest membership announcement is part of an ongoing strategic initiative to increase membership support of the association so that it is better positioned to protect and promote the business interests of organizations involved in the self-insurance/ captive insurance marketplace. Upgraded members (Silver, Gold and Diamond) receive a variety of additional membership benefits. Details can be accessed on-line at www.siia.org, or by contacting SIIA Membership Director Jennifer Ivy at jivy@ siia.org. Learn more about Rx-Precision at www.rx-precision.com. you would like to share with your peers? We would like to in vite you to share your insight and submit an article to The Self-Insurer ! distributed in a digital and print format to reach over 10,000 readers around the world. The Self-Insurer has been delivering information to the self-insurance /alternative risk transfer community since 1984 to self-funded employ ers, TPAs, MGUs, reinsurers, stoploss carriers, PBM s and other service providers. Byars at sbyars@sipconline.net for advertising information. Insurance products underwritten by Westport Insurance Corporation. Zelis Healthcare is a healthcare information technology company that provides solutions which address pre-payment to payment needs across the claims life cycle. Find out what Fully Integrated Healthcare Cost Management can do for you! Visit us at Zelis.com Copyright 2016 Zelis Healthcare. All rights reserved. Another $500,000 claim? We can help. EthiCare saves claim payors money. Period.